Apple on Tuesday unveiled two new iPhones: the iPhone 5s and the iPhone 5C. "iPhone 5 was instantly the most-loved iPhone ever, and it had the most successful first year of any iPhone we've ever done," Apple CEO Tim Cook said. "The business has become so large that this year we're going to replace the iPhone 5...and we're gonna replace it with not one, but two new designs." These include the powerful iPhone 5s and the colorful iPhone 5c. 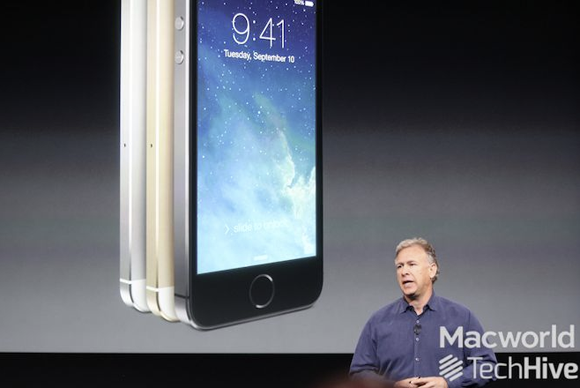 "The most forward-thinking phone we've ever created," Schiller said of the new iPhone 5s (shown at top). The iPhone 5s comes in three metal finishes: silver, gold, and something called "space gray." It's made of high-grade aluminum, with chamfered edges. Schiller said that the iPhone 5s offers great, unparalleled performance, calling it a "huge leap forward." The phone uses the 64-bit A7 system-on-a-chip processor from Apple, and it's the first and only smartphone to use a 64-bit processor. Apple's Phil Schiller introduces the Phone 5s. Apple says the A7 chip uses desktop-class architecture, with a modern instruction set and over a billion transistors—and it's the same size as the A6. iOS 7 already supports a native 64-bit kernel, Schiller said. All the built-in apps from Apple already have been reengineered for 64-bit, and it will be easy for third-party developers to compile their apps for the iPhone 5s as well. "The benefits are huge," Schiller said. The A7 is up to twice as fast at CPU and graphics tasks, he said. The iPhone 5s offers 40 times the performance of the original iPhone—with half of that improvement just coming since the iPhone 5. The iPhone 5s also comes with a nifty new security feature: A fingerprint scanner built right into the Home button. That sensor can read fingerprints with incredible detail, and even supports multiple fingers. Support for that scanner in iOS 7 means you may never need to tap in your passcode again. The iPhone 5s in gold. "Unfortunately, some people find that's too cumbersome, so they don't set it up," Schiller said. And even if you set up a passcode, you need to enter it many times per day. Touch ID uses your fingerprint to gain access to your phone. It does this by reading the fingerprint at an incredibly detailed level using the Touch ID sensor. Touch ID scans sub-epidermal skin layers with 360 degrees of readability—meaning you can hold your finger in any orientation. The sensor lives beneath the Home button on the iPhone 5s. That button is still tactile, but includes a stainless steel detection ring and the Touch ID sensor, with a laser-cut sapphire crystal on top. Touch ID is built deep into iOS 7, Schiller said. You can simply touch the Home button to unlock your iPhone. You can use the Touch ID to authenticate anywhere you'd otherwise need to provide your Apple ID password, too. Touch ID also supports multiple fingerprints. So, you can unlock your iPhone with multiple fingers, or theoretically let a family member add their fingerprint to unlock your device, too. Schiller said that the camera on the iPhone 5s is dramatically improved over its predecessor. He cited what he called "huge advancements": There's a new five-element, Apple-designed lens, with a larger 2.2 aperture, and a 15 percent larger active sensor area. The pixels on the sensor are 1.5 microns, Schiller said, and he said that bigger pixels lead to better pictures. The camera also includes a new True Tone Flash. The iPhone 5s camera also adds automatic image stabilization. It combines multiple photos taken simultaneously in real-time to stabilize and sharpen images. And the camera includes burst mode, too. The leather cases for the iPhone 5s cases. There's a new video camera option, too: a Slo-Mo camera, which shoots 120 frames per second in high definition. There's another completely new part in the iPhone 5s called M7: a motion co-processor. It continually measures motion data from the accelerometer, gyroscope, and compass, without waking the A7, which Schiller said would enable new fitness accessories and apps. In conjunction with a new CoreMotion API, Schiller said that developers could create apps to measure and track fitness in ways that weren't possible before. The iPhone 5s's battery life is equal to or greater than the iPhone 5's, Schiller said, with 10 hours of 3G talk time or LTE browsing. The iPhone 5s is available in 16GB for $199, 32GB for $299, or 64GB for $399. Apple is also offering six leather cases for the iPhone 5s at $39 each. The iPhone 5s will be available in the U.S., Australia, Canada, China, France, Germany, Hong Kong, Japan, Puerto Rico, Singapore and the U.K.
Orders for the iPhone 5s start on September 20, and they will be available from the Apple Online Store, Apple’s retail stores, and through AT&T, Sprint, T-Mobile, Verizon Wireless, as well as select Apple authorized resellers. The unlocked prices for the 5s are $649 for the 16GB model, $749 for the 32GB model, and $849 for the 64GB model. Though the iPhone 5 will be retired, Apple will continue to offer the iPhone 4S in a free 8GB model. "The iPhone 5c is made with all the incredible technology customers have loved with the iPhone 5," Apple senior vice president Phil Schiller said. "It's more fun and more colorful than any iPhone we've had yet." The iPhone 5c is available in a variety of colors: blue, green, white, pink, and yellow. The fronts of the phones are black, while all the rest of the body uses the new color, including the buttons and switches. The iPhone 5c comes in five bright colors. When you turn on the iPhone 5c, the default wallpaper is color-matched to the phone's body. There's also a new line of custom cases, made of a soft-feel silicon rubber with microfiber internals, and cutout patterns of circles on the bottom two-thirds of the case. 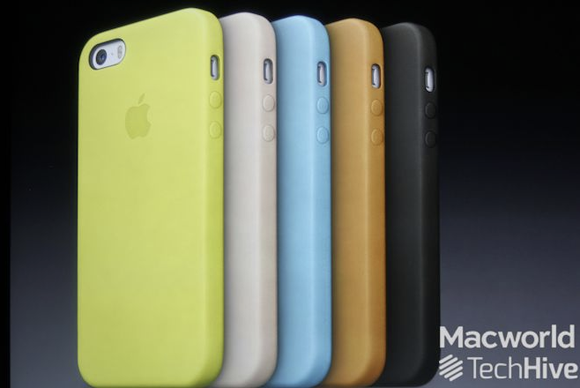 "You get this amazing combination of color between the iPhone 5C and its case." On the front, the iPhone 5c sports a new FaceTime HD camera that Schiller said is improved from prior iterations. And the phone supports more LTE bands than any other smartphone in the world, Schiller said. The iPhone 5c costs $99 for the 16GB model, or $199 for the 32GB model, with a two-year contract. The cases are also available in the same six colors; they're available for $29 each. The unlocked prices for this model are $549 for the 16GB version and $649 for the 32GB version. You may pre-order the iPhone 5c starting on September 13. It also will be on sale September 20 in the Apple Online Store, Apple’s retail stores, and through AT&T, Sprint, T-Mobile, Verizon Wireless, as well as select Apple authorized resellers. Updated 09/10/2013 at 11:45 a.m. with additional information on the Touch ID feature in the iPhone 5s, as well as details on ordering and availability for both iPhones. The iPhone 5c offers enough new features at an attractive enough price to make it an affordable upgrade to anyone who still owns a iPhone 4 or 4s.